Tiny Tahitian Pearl Necklace, Genuine Saltwater Keshi Pearls, June Birthstone, Rainbow Tahitian Pearls, 18"
This tiny Tahitian pearl necklace is made with genuine saltwater keshi pearls all the way from the Tuamotu archipelago in French Polynesia. Made of solid nacre, these beautiful pearls were cultured in the black lipped oyster and are miniaturized versions of full size Tahitian pearls. Barely bigger than grains of rice in an array of rainbow colors, they really are quite special and rare. 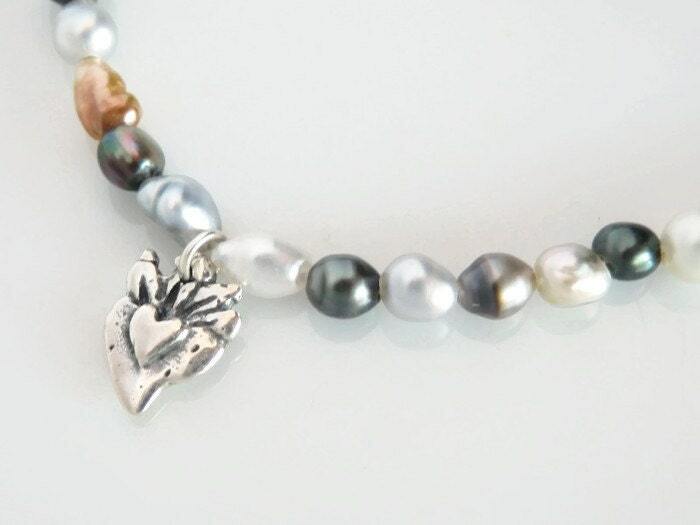 Accented with a tiny sterling silver heart charm, this necklace would make an amazing gift for a pearl lover and will arrive wrapped free of charge. Pearls are the birthstone for June. This necklace measures 18 inches (45.7 cm) in length and is finished with hand oxidized sterling silver chain and my signature bluebird charm at the clasp. Thirty tiny keshi in shades of white, blue, gold, silver and peacock have been hand strung at the front and wire wrapped as accents in back. Individual pearls are in the range of approximately 3mm x 5mm in a variety of organic freeform shapes and dimensions. In the fourth listing photo they are shown with grains of rice and a mercury dime which is the same size as a modern U.S. dime, approximately 18mm in diameter. All photos have been enlarged to show detail. My photos are taken in natural light and are not color enhanced. Of course there may be differences in computer monitors, and pearls naturally shift in color depending on light source and the clothing you wear. I feel that the colors in the photos are accurate reflections of these tiny beauties with the exception of the golden pearl, which, to my eye, is more golden in person and less burnt orange. Tahitian Black Pearl Necklace, Baroque Pearl Necklace, Large Pearl Necklace, Sugar Skull Necklace with Saltwater Pearls, 19.5"
Long Pearl Rope Necklace with Labradorite, Rosebud and Keshi Pearls, Multicolor Long Pearl Necklace, Artisan Sterling Lotus Toggle, 40"
White Baroque Pearl Necklace, Sterling Silver Spike Necklace, Edgy Pearl Necklace, Freshwater Ripple Pearls, 17"
Wore these tonight and go so many compliments!! They’re gorgeous!! I love this ring! It’s exactly what I expected and wanted. I get compliments all the time! Thank you! 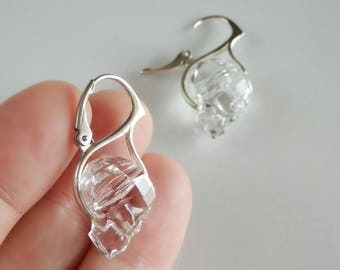 These are so beautiful and unusual. The crystal catches the light and sparkles. Plus these are very well made - beautiful craftsmanship. I really like how you can't easily tell these are skulls - they are discretely goth. LOL! Nicely packaged, fast shipping. Very happy! Thank you! Purchases made in this shop are processed by Etsy and PayPal. Bluebirrrd Dreams does not receive your credit card or other financial information. Uniqueness in handmade and vintage work is inevitable. I welcome any questions you have before making a purchase. Above all else I want you to be satisfied with your transaction. Please contact me by Etsy conversation within 3 days for return instructions and mail your return within 7 days. Cancellation requests are accepted within 12 hours of purchase. I do not accept returns for custom orders, personalized items or clearance items. Return shipping arrangements are the responsibility of the buyer. Insurance, which protects the sender, is recommended but optional. Upon receipt of your return, a refund will be completed minus a 15% restocking fee or the cost of original shipping, if shipping was charged. Refunds will not be made on items that are returned without communication through Etsy, or on items that are not returned in the same condition in which they were shipped. In the event of a gift return, refund will be issued to the original buyer. For refused or unclaimed packages, any applicable return shipping costs will be deducted from the refund amount. In stock items ship in 1-3 days of cleared payment. Processing time for custom orders varies by project. US Postal Service shipping times are non-guaranteed estimates. International shipping times may vary depending on location and customs. All orders include tracking, delivery confirmation and insurance. In the event of a damaged or lost package, your assistance will be needed to file a claim. USPS First Class shipping is included for all orders mailed within the United States. Free shipping does not apply to Priority Mail shipping upgrades or international orders. The full value of all orders will be declared on international shipments as required by law. Any duty, VAT, tariffs or import taxes charged by your home country will be your responsibility to pay. Please check with your customs office and postal service for additional information. I will only use your shipping and billing address and contact information to communicate with you about your order, to fulfill your order and in my business record keeping. Caring for Pearls: Pearls should be stored in cloth bags which are soft and allow them to breathe. They should be protected from lotions, perfumes and other chemicals. Wipe pearls clean with a soft cloth after each wear. As needed, my pearl pieces may be rinsed in lukewarm water and patted dry. Pearls should never be kept in a safe or safety deposit box as the dry, uncirculated air will damage their pearly luster. Caring for Sterling Silver: Sterling silver jewelry will naturally tarnish over time but may be hand polished to restore its shine or be stored in airtight plastic bags to slow the tarnishing process. Caring for Vermeil and Gold Fill: Vermeil and gold filled jewelry should be wiped clean after wear and may be washed in lukewarm water. These pieces should not be polished as abrasives may expose the underlying metal.